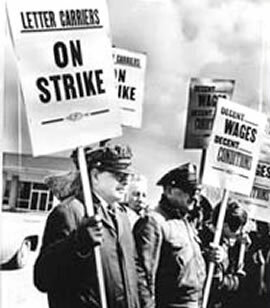 Postal workers picket during the Great Postal Strike of 1970. Photo Courtesy of the APWU. In the 1960s, the number of work stoppages staged by public workers, such as teachers, bus drivers, and other local government employees, rose. The largest public worker strike in U.S. history began in March 1970, as almost one third of the nation's 750,000 postal employees walked off the job. With mail service paralyzed in New York City, Detroit, and Philadelphia, President Nixon declared a state of national emergency and ordered soldiers to New York City post offices to fill in for striking workers. The Taft-Hartley Act of 1947 gave the president the power to do this.